Perched just above the ocean at the northern end of Langs Beach and tucked away in the surrounding QE II native bush is a large, comfortable family home that blends in with its environment and looks directly out over the water to the islands. Spectacular views include the Pancake Rocks on the coast as the tide changes. Delightful bush tracks from the house lead you down to join the Waipu Coastal Trail or the Pancake Rocks, where you can chill with a good book or a camera, with the waves lapping at your feet and enjoy a spot of fishing as well. It doesn’t come any better than this! As the house is up on poles, birdlife is all around you in the treetops. Truly serene and peaceful location – an ideal place to relax and unwind and yet just a 5-10 minute walk to beautiful Ding Bay and main Langs Beach. The homestead is laid out over three levels. The downstairs level is a one bedroom flat (no internal access) with its own lounge area, bathroom and kitchenette and with its own deck. The middle level is an open-plan family living/kitchen/dining and bathroom, with fantastic indoor/outdoor flow to the deck where you will spend most of your time soaking in the tranquillity of this location. The top level has a massive dorm style bedroom that can sleep up to 9 guests, with screens to provide privacy and another bathroom for added convenience. Configure the house to suit you – smaller groups can rent upper levels only, or take just the self-contained downstairs unit. Please enquire for part-house rates. The driveway is steep but easy enough to manage, and gives access to the double garage, parking and turning area. Ding Bay, Langs Beach, Waipu Cove are all very close. Mangawhai Village is a short 10-15 minute drive to the south or Ruakaka beach and Waipu Village 5 to 15 minutes to the north. 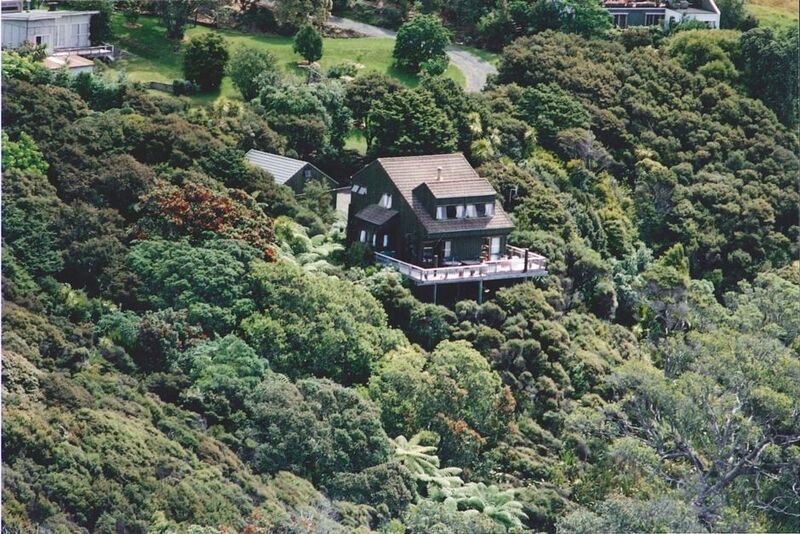 Bush hiking, Waipu Glowworm Caves, golf, village shopping, cafe and restaurant dining are all in the local area. Then of course there is the diving, fishing, surfing, swimming as well! Check in is 4pm, check out is 11am. Early/late check outs are on request basis.Two-night minimum stay. The bach exceeded expectations. Incredible view, perfect location and plenty of space for a group or family. Had everything we needed. Would definitely recommend, we will be going back.10/10. Thanks Jihyun! It was a pleasure to host you – and recommend you to all other hosts. Good communication, lovely guests who left everything clean, tidy and secure - they even washed the tea towels etc at the end of their stay! Great spacious house in a tranquil and private spot on the coast, lots of space in the living area with wide decks and a magical view out to the islands and up to Whangarei heads that you never get sick of looking at! Only downside is there are no walls at all between beds upstairs and only double and single beds. Could do with a dishwasher as no one likes dishes whilst on holiday ?? Great location and very tidy accommodation. We hope you will enjoy your stay – the fabulous views to the Hen and Chicken Islands from the house and from the Pancake Rocks below, the walkways through the regenerating native bush, and just a short walk down the road, the sparkling waters of Ding Bay and Langs Beach. And the night sky is perfect for stargazing on a clear night – if you lie on the deck just after sunset, you can see satellites as they travel by. Hikers can try out the Waipu Coastal Walkway which runs along the shore edge of the property. Access via one of our bush walkways, or from Cove Rd opposite Waterman Drive, or from Waipu Cove.